Had the heart of man not been so set on evil continually there would not have been sought the need of a SAVIOUR. It grieved the Lord in His heart He created man and would then have to destroy His own creation. (Genesis 6:5-7). As a Christian we know God is love and by His Spirit lives within us, and it is by His Spirit do we know God has sent His Son to be the SAVIOUR of the world. (1 John 4:11-15). Beloved, if God so loved us, we ought also to love one another. No man hath seen God at any time. If we love one another, God dwelleth in us, and his love is perfected in us. Hereby know we that we dwell in him, and he in us, because he hath given us of his Spirit. And we have seen and do testify that the Father sent the Son to be the Saviour of the world. Whosoever shall confess that Jesus is the Son of God, God dwelleth in him, and he in God. In the book of Isaiah God doesn’t mince words when He says who He is and that His witnesses who are called by His name and are formed for His glory know there is no other God nor is there any other SAVIOUR! (Isaiah 43:7-12). Even every one that is called by my name: for I have created him for my glory, I have formed him; yea, I have made him. Bring forth the blind people that have eyes, and the deaf that have ears. Let all the nations be gathered together, and let the people be assembled: who among them can declare this, and shew us former things? let them bring forth their witnesses, that they may be justified: or let them hear, and say, It is truth. Ye are my witnesses, saith the Lord, and my servant whom I have chosen: that ye may know and believe me, and understand that I am he: before me there was no God formed, neither shall there be after me. I, even I, am the Lord; and beside me there is no saviour. I have declared, and have saved, and I have shewed, when there was no strange god among you: therefore ye are my witnesses, saith the Lord, that I am God. May we learn to deny what is not of God and live soberly and righteously in this life so at the returning of our Lord and SAVIOUR we are redeemed and unashamed of the Lord we served. 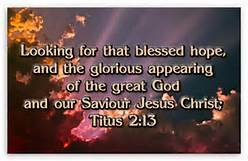 (Titus 2:11-15). For the grace of God that bringeth salvation hath appeared to all men, Teaching us that, denying ungodliness and worldly lusts, we should live soberly, righteously, and godly, in this present world; Looking for that blessed hope, and the glorious appearing of the great God and our Saviour Jesus Christ; Who gave himself for us, that he might redeem us from all iniquity, and purify unto himself a peculiar people, zealous of good works. These things speak, and exhort, and rebuke with all authority. Let no man despise thee.